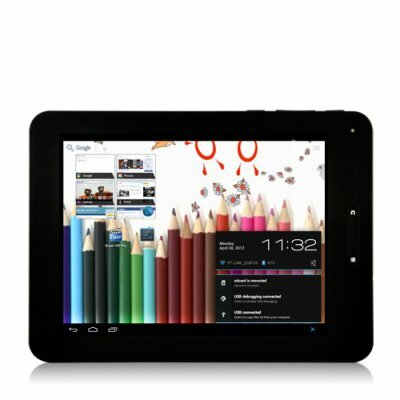 Successfully Added Android 4.0 Tablet PC "Azure" - 8 Inch Capacitive Touch Screen, 4GB to your Shopping Cart. Experience the all new Android 4.0 ICS operating system and amazing multimedia on the go with the Azure Android Ice Cream Sandwich Tablet. With a large 8 inch touchscreen, it’s your perfect tablet to enjoy internet, movies, or games anywhere you want. The All New Android 4.0 ICS You've Got to Try Out: Refined and evolved UI, resizable Widgets, redesigned Gallery apps, improved web browsing... there are tons of new features and enhancements with Android 4.0 waiting for you to explore. The Azure Tablet’s Android 4.0 makes common actions more visible and lets you navigate with simple, intuitive gestures. Refined animations and an entirely new typeface improve readability and bring a polished, modern feel to the user interface. The new Android 4.0 is simply more Simple, Beautiful, and Useful. Take the Azure with you, to the Beach, or to the Sky… The Azure is your perfect companion to enjoy some hours on the beach, on the plane, or on a long train trip. With the Azure’s rich multimedia features, you can browse the internet using WiFi, watch videos on YouTube, read ebooks, enjoy movies, and play your favorite games. In addition, with apps like SmartOffice, you can view, edit and create documents including Word, Excel, and PowerPoint. For play or work, the Azure will meet your every need. The Azure 8 Inch Android 4.0 Tablet is a must have for any gadget lovers and best of all, it’s brought to you at a factory-direct price that can't be matched. Available in our warehouse now, it is ready for immediate shipment to you or your customer. Guaranteed to be the next hot item in your online store, order now before everyone has one and make a nice profit for yourself. Brought to you by Chinavasion, the leader in wholesale consumer electronics. - Ebook: PDF, TXT, Word etc. Download your favorite apps through the Google Play Store. Use HDMI out to connect to your television for a large screen display! This tablet supports 3G internet through an external 3G dongle (not included). on 2012-07-01 03:38:54 Great tablet - works awesome! It is not the iPad but it is fairly close. I cannot imagine being without my tablet. I should have gotten the one with 1GB of RAM but it isn't even that noticeable. Well worth the money. Great tablet - works awesome! This tablet is exactly what I expected. It feels very solid. Nice bright display. Wifi reception is above average. It gets signal in all areas where my HP netbook connects. Thoroughly recommended! Closer thing to an iPad for 1/4 of the cost. ESPAÑOL: Recomiendo ampliamente esta tableta! simplemente... perfecta por el precio. on 2012-06-06 07:51:06 Contends with droid tablets of higher price ranges!!! Like most chinavasion products it came unbranded and in a basic mailing box. I opened it up and found the tablet, the usb cable, a standard wall charger and an american plug adapter. When I turned it on I found it had a decent boot up time, great screen quality and the battery was full. I scanned thru the settings, found the time and date stay accurate, wifi connects no problem and it has a camera. I also found that it had a few pre-installed apps like flash player, youtube and google. Google Play is also already on which is a very good thing, that means I have direct access to the premier collection of android apps on the web (total plus for this tab). Downloaded angry birds and played a few rounds just fine, no lag in play or touch sensitivity. Downloaded the firefox browser, that works fine too. Also tested the screen adjustment with a few flips, screen auto-corrects all 4 directions. Shut it down to test reboot, rebooted just fine. So far this shows to be a promising $125 purchase, I'll update if I get any new developments or come across any problems. P.S. I did this review on the tablet!